President Nestor Kirchner and first lady Cristina Fernandez will switch jobs in December after Argentines elected a female president for the first time and launched their country's most powerful political dynasty since Juan and Evita Peron. Fernandez is a lawyer and senator who followed her husband as he rose from an obscure governorship to the presidency, drawing comparisons to Sen. Hillary Rodham Clinton. She will bring a feistier and more glamorous style to the Pink House, Argentina's presidential palace, in which she has already spent the last four years. But it is unclear how much change she will bring. Analysts say her strong win gives Fernandez an opportunity to right the problems of her husband's administration, including high inflation, an energy crisis and a shrinking budget surplus. 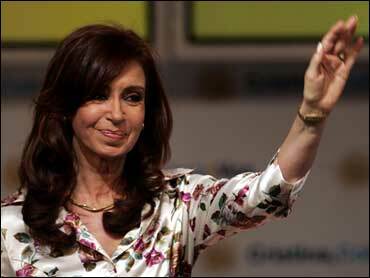 Some warned her not to see it as an endorsement of all of Kirchner's policies. "We have won amply," she said. "But this, far from putting us in a position of privilege, puts us instead in a position of greater responsibilities and obligations." With more than 96 percent of polling places reporting, Fernandez had 45 percent of the vote, compared with 23 percent for former lawmaker Elisa Carrio and 17 percent for former Economy Minister Roberto Lavagna. Eleven others split the rest. Fernandez needed 40 percent and a margin of 10 percentage points over the runner-up to avoid a runoff. But no major problems were reported as Argentina's 27.1 million registered voters, in addition to the presidency, filled dozens of House and Senate seats and nine governorships. Vice President Daniel Scioli won the race for governor of Buenos Aires province, the country's second most powerful post. "Her husband had the advantage of everyone saying, `He got us out of the crisis,"' said Michael Shifter of the Inter-American Dialogue think tank in Washington. "Well, they can't say that about her, because they already got out of the crisis." "This is a dynasty-in-waiting, but it will collapse as they all do if she can't get a team together to differentiate herself from Nestor Kirchner," he said. She will be Argentina's second female president; Isabel Peron - who married Juan Peron after Evita's death - was his vice president when he died in 1974, and served for 20 chaotic months before a military coup ousted her. As for Kirchner, he has said he'll be happy as "first gentleman" after he hands his wife the presidential sash and scepter on Dec. 10. But few expect him to fade too far into the background - and some even suspect the couple is plotting to reverse roles again in 2011.